Organic black tea mixed with herbs & spices makes an amazing marinade for fish or poultry, creating a crust that is healthy and full of flavour. Try our Berry Delicious with Blueberry or Golden Syrup Pancakes, or with a fresh muffin for breakfast/brunch. If you’re not a morning person, try incorporating iced tea into your favourite fruity cocktail! As we said, the possibilities are endless! Have our Tea Pairing Infographics helped you to see tea from a different perspective and given you some culinary inspiration? It really is eazy peazy! 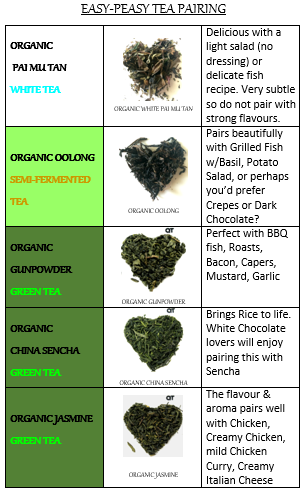 This entry was posted in Cooking, Food and Wine, Spice, Tea, Tea Blog, Uncategorized and tagged #cookingwithtea, #foodpairing, #greentea, #icedtea, #organictea, #tea, #teapairing, #whitetea. Bookmark the permalink. ← Palate Cleansing with TEA – Indulge Your Tastebuds!